Usually the Sea Shepherd Conservation Society has their hands full protecting whales from Japanese hunting boats or documenting the carnage at the infamous Taiji Cove. However, while they will still be dedicated to protecting marine life until there is no further need to, Sea Shepherd is venturing into new waters with their upcoming Vortex Project. This non profit organization will work in collaboration with denim superstar G-Star RAW and Pharrell William's eco-friendly fashion company Bionic Yarn to turn ocean waste into fashion. 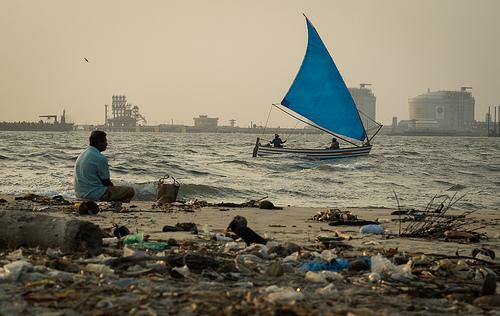 The Vortex Project will have Sea Shepherd's USA chapter visiting some of the most polluted areas along the coast to help clean up plastic debris and restore the ecosystem. The plastic debris will then be turned over to G-Raw and Bionic Yarn who will process it into a new brand of sustainable fabric and fashion. However, the recycling doesn't end there. The project boasts that it will then close the loop of waste by recycling the products at the end of their life cycle and manufacture new ones from them. This way, it will prevent any of the further pollution that other eco-friendly companies neglect to address. Sea Shepherd founder, Captain Paul Watson said in the official press release, “Plastic is choking our oceans and precious marine wildlife at an unprecedented rate. Straws, single-use bags, six-pack rings, drink lids and more are ensnaring marine animals or blocking their digestive systems, killing these magnificent creatures. It’s time humanity takes responsibility for our actions and cleans up the mess we’ve made. We hope this is the first of many meaningful collaborations to come." The first of many collaborations in the Vortex Project will premiere in August 2014 with G-star's "Raw for the Oceans" denim line. Consumers will be able to purchase some of this sustainable fashion online as early as August 15th. Get Involved with the Sea Shepherd Conservation Society Today!